Boston’s St. Patrick’s Day parade dates back to 1901, and has been held continuously . For a complete history of the parade, click here. The Parade will travel through South Boston, starting at Broadway Station. View a larger printable PDF version PDf the Boston St. Patrick's Day Parade Route Map here. 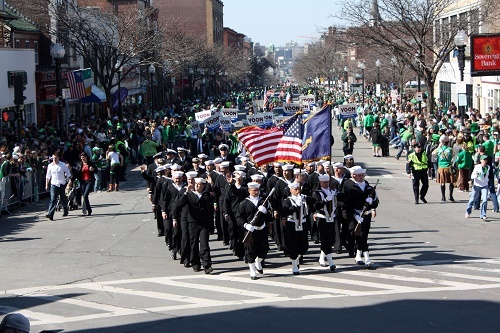 The parade now includes representatives from Boston's Irish groups and is is viewed by more than 1 million live spectators, over a 3.2 mile route. The Boston parade is televised live on NECN, with re-broadcasts and highlights available online. The MBTA subway is a great way to get in and out to see the parade. Find the Boston parade's Facebook page here.